A young woman enters a whole new world of attraction in a community struggling with generations of loss of land and culture. Yasmeen’s tradition-bound mother wants her to stay in Montreal, get married, and have babies. But the young Syrian-Canadian wants more. Her appetite for adventure leads her to a teaching job in the northern Quebec village of Saqijuvik. Eager to adopt her new home and its Inuit inhabitants, Yasmeen embraces every experience that comes her way: camping on the tundra, hunting for ptarmigan, sewing with the local women. She plunges into her northern adventure, no holds barred. But it’s 1983 and instead of the ideal, pristine Arctic Yasmeen imagined, she uncovers a contradictory world of igloos and pool halls, Sedna and Jesus, raw caribou and alcohol. In the middle of everything is Joanasi, a beautiful but volatile man who leads her into territory that is almost as unsettling as the land itself. 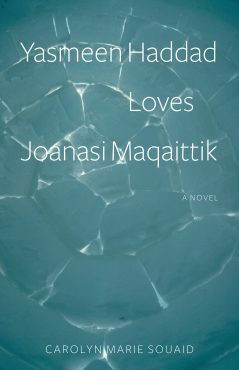 Yasmeen Haddad Loves Joanasi Maqaittik is a story of powerful love and potent lust. It is a tale of adventure, of the attempt to bridge worlds and cultures, of self-discovery in the face of the unknown. Set in the vast and beautiful North, it pushes past the standard narrative of southerners bringing “civilization” to a people who have survived in the most unforgiving of environments for over a thousand years. Carolyn Marie Souaid is an award-winning author of seven poetry collections, most recently This World We Invented. She has performed at festivals and literary events in Europe, Canada and the US and her work has been translated into French, Arabic, Spanish and Slovenian. Her poems and short stories have appeared in magazines including The Malahat Review, The New Quarterly, and the Literary Review of Canada, and have been featured on CBC Radio. She lives in Montreal. “I have been telling my friends about your book. I want to say “bravo” and thank you. You have a keen eye on spirit and culture. Yasmeen exists in many forms and Joanasi’s treatment of her evokes memories of my own personal journey in a sadly unsuccessful marriage. Her inevitable realization of the nature of her relationship with Joanasi is agonizingly sharp. Even Pasha, Joanasi’s mother, made me reflect on women I have met and known in my life. She does what many a mother of a Joanasi would do in real life. Yes, I thoroughly enjoyed your book.” Ida L. Saunders, Kuujjuaq in a letter to Carolyn Marie Souaid.